NIST-F1, the nation's primary time and frequency standard, is a cesium fountain atomic clock developed at the NIST laboratories in Boulder, Colorado. NIST-F1 contributes to the international group of atomic clocks that define Coordinated Universal Time (UTC), the official world time. Because NIST-F1 is among the most accurate clocks in the world, it makes UTC more accurate than ever before. The uncertainty of NIST-F1 is continually improving. In 2000 the uncertainty was about 1 x 10-15, but as of January 2013, the uncertainty has been reduced to about 3 x 10-16, which means it would neither gain nor lose a second in more than 100 million years! The graph below shows how NIST-F1 compares to previous atomic clocks built by NIST. It is now approximately ten times more accurate than NIST-7, a cesium beam atomic clock that served as the United State's primary time and frequency standard from 1993-1999. NIST-F1 is referred to as a fountain clock because it uses a fountain-like movement of atoms to measure frequency and time interval. First, a gas of cesium atoms is introduced into the clock's vacuum chamber. Six infrared laser beams then are directed at right angles to each other at the center of the chamber. 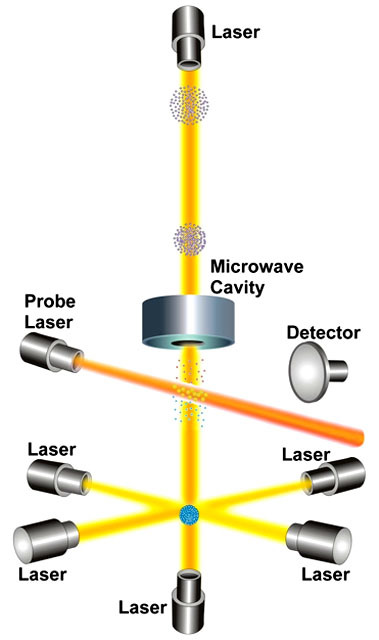 The lasers gently push the cesium atoms together into a ball. In the process of creating this ball, the lasers slow down the movement of the atoms and cool them to temperatures near absolute zero. Two vertical lasers are used to gently toss the ball upward (the "fountain" action), and then all of the lasers are turned off. This little push is just enough to loft the ball about a meter high through a microwave-filled cavity. Under the influence of gravity, the ball then falls back down through the microwave cavity. The round trip up and down through the microwave cavity lasts for about 1 second. During the trip, the atomic states of the atoms might or might not be altered as they interact with the microwave signal. When their trip is finished, another laser is pointed at the atoms. Those atoms whose atomic state were altered by the microwave signal emit light (a state known as fluorescence). The photons, or the tiny packets of light that they emit, are measured by a detector. This process is repeated many times while the microwave signal in the cavity is tuned to different frequencies. Eventually, a microwave frequency is found that alters the states of most of the cesium atoms and maximizes their fluorescence. This frequency is the natural resonance frequency of the cesium atom (9,192,631,770 Hz), or the frequency used to define the second. The combination of laser cooling and the fountain design allows NIST-F1 to observe cesium atoms for longer periods, and thus achieve its unprecedented accuracy. Traditional cesium clocks measure room-temperature atoms moving at several hundred meters per second. Since the atoms are moving so fast, the observation time is limited to a few milliseconds. NIST-F1 uses a different approach. Laser cooling drops the temperature of the atoms to a few millionths of a degree above absolute zero, and reduces their thermal velocity to a few centimeters per second. The laser cooled atoms are launched vertically and pass twice through a microwave cavity, once on the way up and once on the way down. The result is an observation time of about one second, which is limited only by the force of gravity pulling the atoms to the ground. As you might guess, the longer observation times make it easier to tune the microwave frequency. The improved tuning of the microwave frequency leads to a better realization and control of the resonance frequency of cesium. And of course, the improved frequency control leads to what is one of the world's most accurate clocks. NIST-F1 was developed by Steve Jefferts and Dawn Meekhof of the Time and Frequency Division of NIST's Physical Measurement Laboratory in Boulder, Colorado. It was constructed and tested in less than four years. The current NIST-F1 team includes physicists Steve Jefferts and Tom Heavner.